In Muang Xay, the provincial capital, visit the Chinese market next to the Kaysone monument to see a variety of local products from Oudomxay as well as imported Chinese goods. Take a walk outside of town to see That Phouxaya a top the mountain overlooking Xay for a birds-eye view of the surrounding valley. 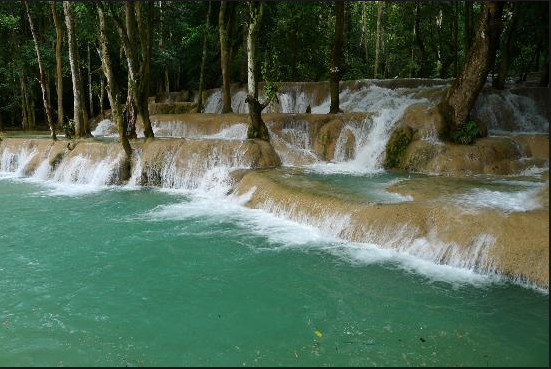 The countryside around Xay has several beautiful natural features to visit, including Tad Lak Sip-et (kilometer 11 waterfall) set in a stunning limestone environment, and the peaceful Houay Nam Kat Waterfall. Chom Ong Cave is situated 45km from Oudomxay near the Khmu village of Chom Ongthai. Entering the cave you can follow the spring of the Nam Kaeng River for 1.600m passing through large halls with heights of up to 35m and widths of 20m. Visit the therapeutic baw nam hawn (hot springs) on the road to Phongsaly in Muang La to soothe aching muscles, or the Singkham Buddha Cave that was used to safeguard historical arte facts during the war. 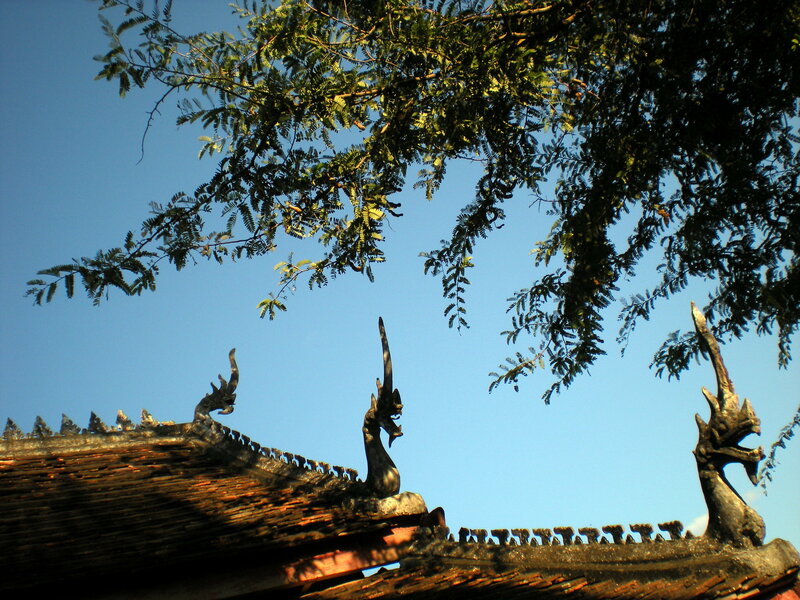 Ban Na Xieng Di has some interesting archaeological sites believed to date back about 500 years. Also unique is the Buddha footprint or phabath found in Bang Nong Nha. Pakbeng, located at the confluence of the Beng and Mekong Rivers is set on a scenic curve of the Mekong shrouded in green mountains. Explore Pha Ho-Pha Hong Cave in Beng District, or experience the shared Lao and Chinese heritage at Ban Theio or Ban Nam Xeng. Visitors can spend time in La District trekking to minority villages in remote and picturesque locations. If you are in Oudomxay during December inquire about the dates of the annual Hmong and Khmu new years celebrations, colorful festivals that include music, trade fairs and lots of local food and drink. Oudomxay Province is famous as one of the places where ancient bronze drums were cast, which have been a symbol of status and wealth for centuries. Master drum makers continue to make these beautiful drums and purchasing a new drum supports this disappearing cultural heritage. Ban Bo village is well known for skilled handicraft production, especially rattan and bamboo basket weaving. Other quality local handicrafts include cotton weavings and shoulder-bag production, salt making, mulberry paper and silk products. From Vang Vieng, I headed north to Luang Prabang. This beautiful city was made a UNESCO world heritage site in 1995 and I’ve got to say its one of my favourite cities in Asian. If you liked Chiang Mai in Thailand then you’ll love this place. 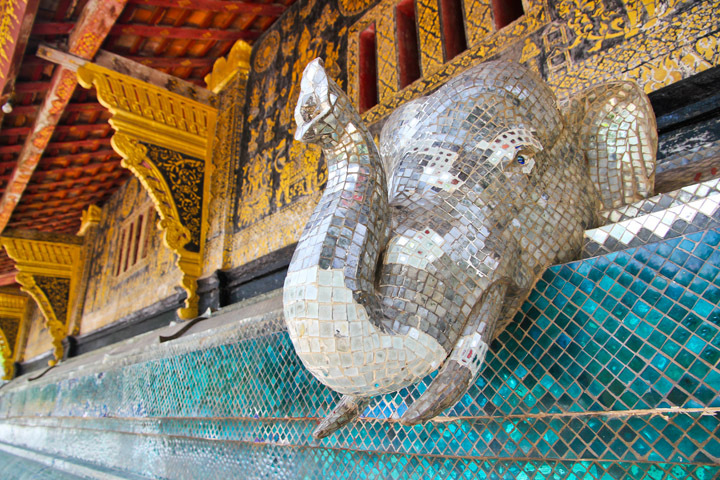 There is certainly a long list of exotic temples, simple museums, and vibrant markets to be visited. I set off to see the sights of Luang Prabang, eager to absorb everything this intoxicating city had to offer. 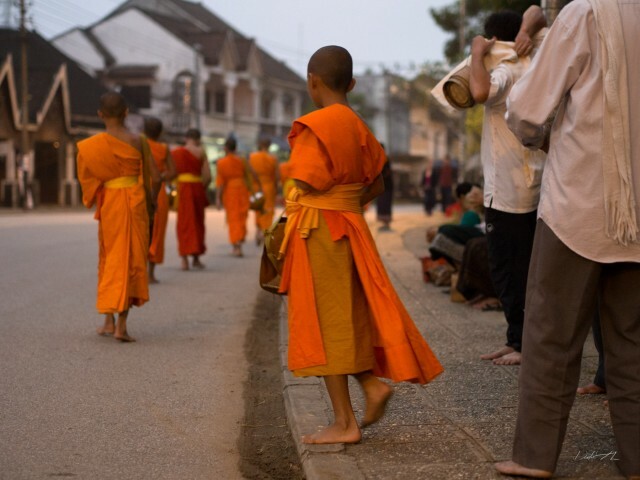 The morning alms procession, known in Laos as Tak Bat, is a beautiful ritual that takes place at dawn all across Southeast Asia. 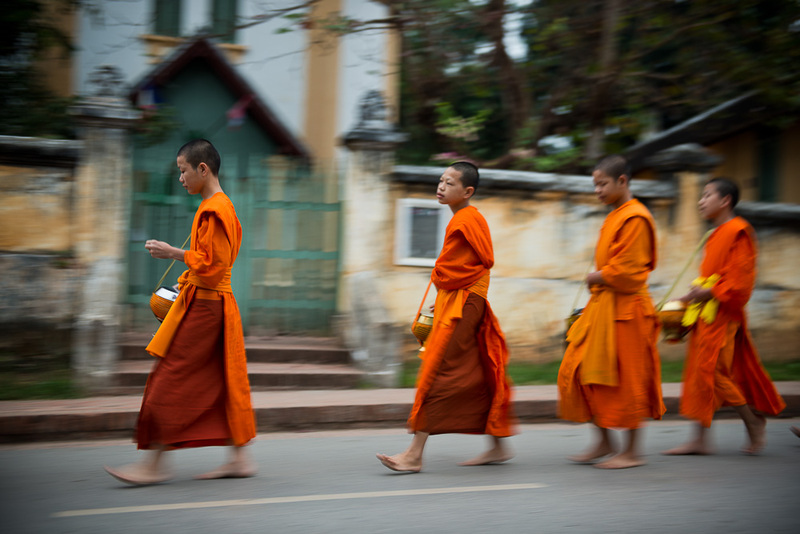 Monks float through the quiet streets, collecting offerings of sticky rice from the devoted. It is a form of meditation for the monks who are living out their vows of poverty and humility; and an act of respect and gaining spiritual merit for the Buddhists who participate. Watching this sacred ceremony is a privilege. Like most things worth having or seeing, it comes with a sacrifice — in this case, waking before dawn. 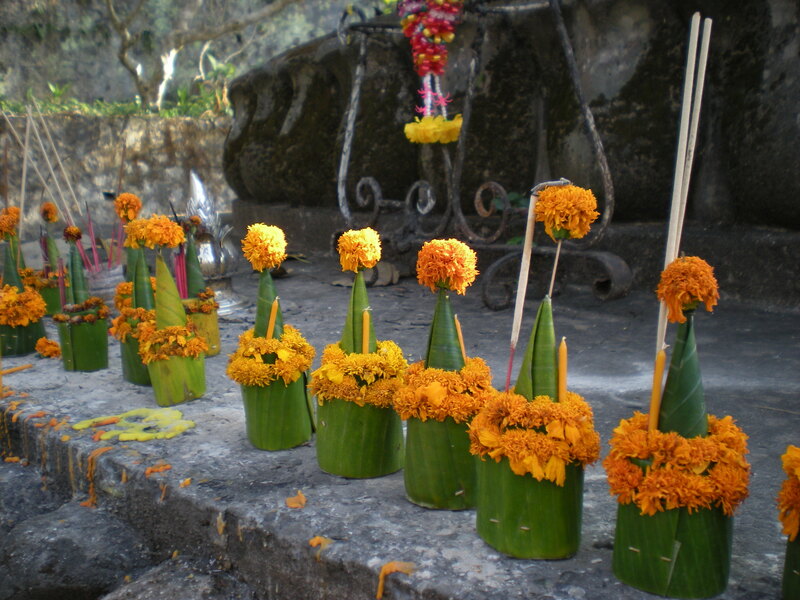 Morning Alms Ceremony – Monks line up in a procession to collect alms from locals, usually in the form of sticky rice. Locals scoop a handful of rice from their bamboo baskets to each monk’s almsbowl. Here, the last of the monks collect their alms for the morning and make their way back to the temple. 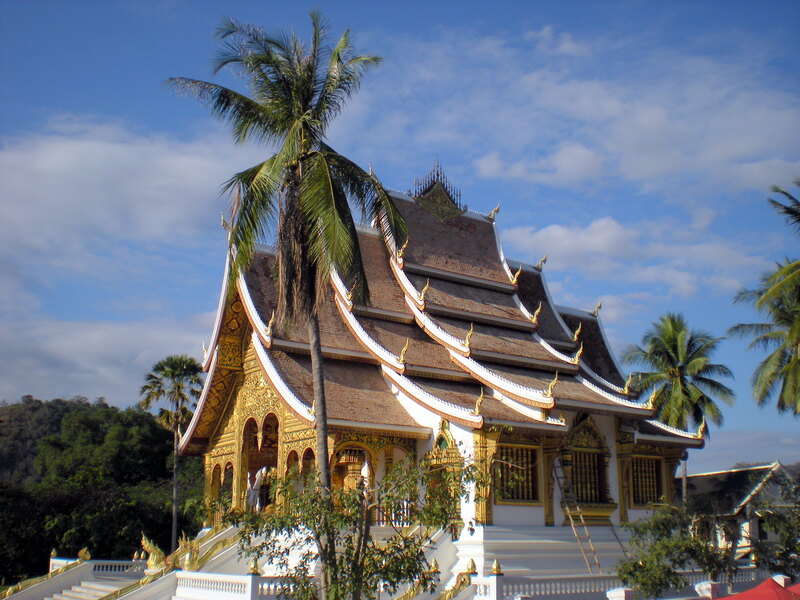 Luang Prabang is a peninsula sitting right between the Mekong and the Mae Kok River. By the river banks you can easily track the pulse that these rivers add to the place. It is still one of the town’s main arteries as far as transport is concerned, and it’s also a great place to haggle for a scenic boat ride. 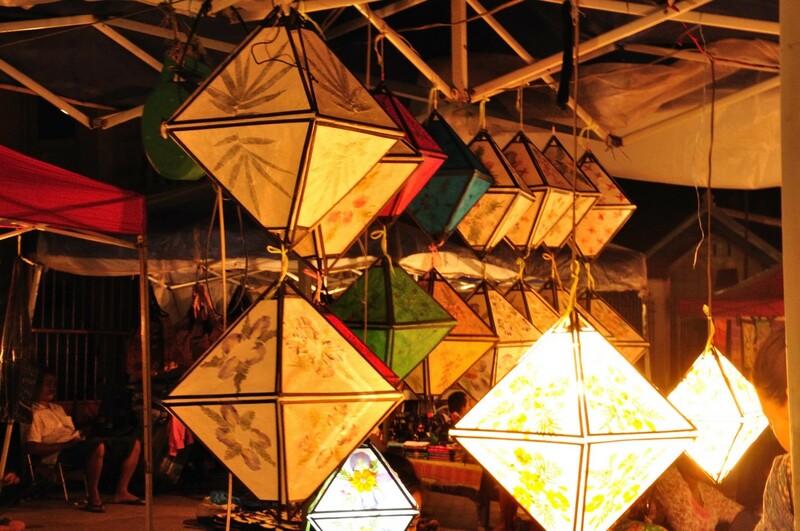 The perfect way to end a day of sightseeing in Luang Prabang is to head to the Handicraft Night Market. This is one destination where tourists certainly outnumber locals, and yet it does not detract from the charm. Possibly the best thing about Luang Prabang is that the shores of the river are lined with bars. Some loud and touristy, others much more low key. 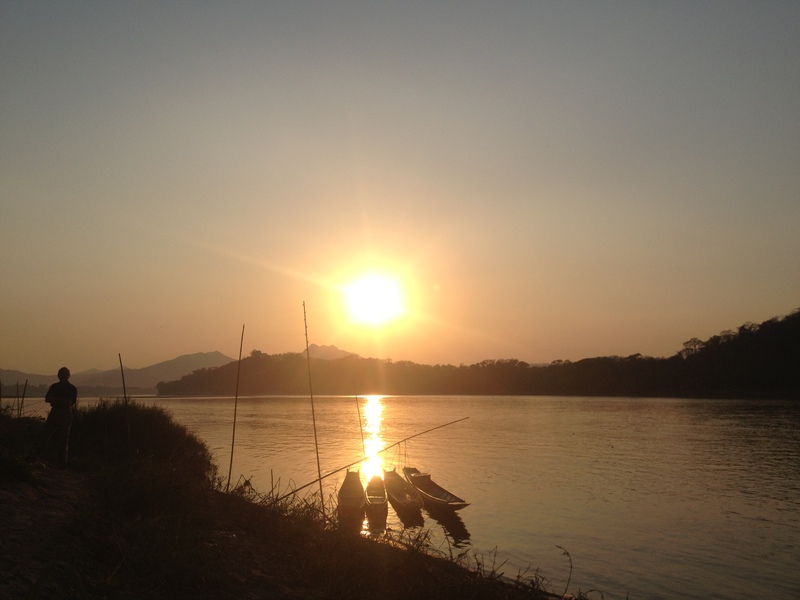 Grab a front row seat to see the spectacular sunset as the sky turns golden over the Mae Kok River. 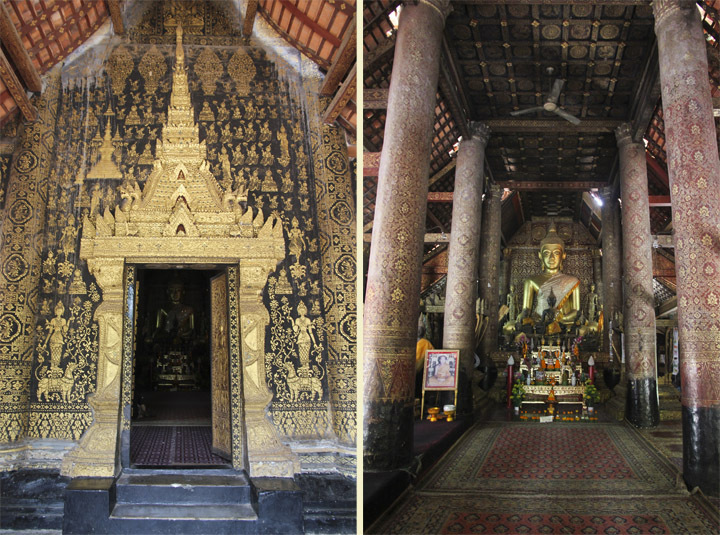 Wat Xieng Thong: This is the most beautiful temple I have ever laid eyes on. One highlight is the symbolic ‘tree of life’ mosaic shown above. The colors, the materials, the attention to detail — they combine to create the visual perfect storm. The Royal Palace Museum: The Royal Palace Museum was built in 1904, was once the main residence of the Lao king. Note that like many attractions around Southeast Asia you must be dressed modestly to enter, meaning no shorts or exposed shoulders. The interior of the residence itself is surprisingly modest, at least when it comes to royalty digs. 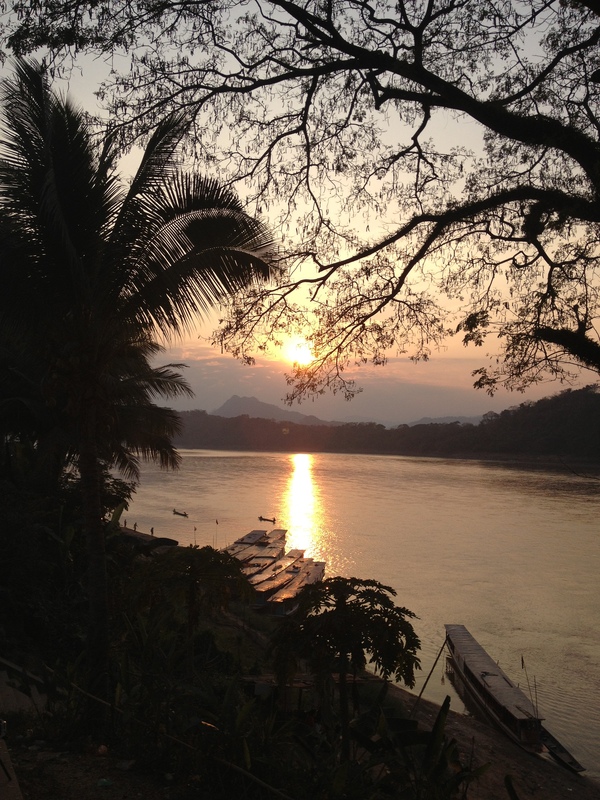 So…these are all pretty good reasons to love Luang Prabang, right? 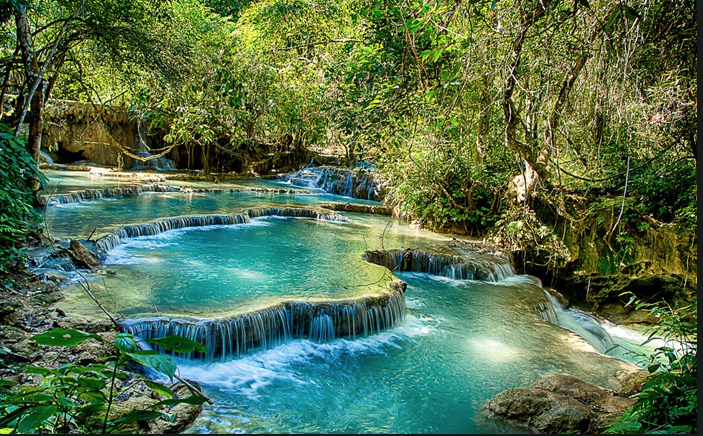 If there is a place that I choose to come back in South East Asia, it will be Luang Prabang. The little town up North of Laos, beside its history, beauty, the quietness, calmness, there is one more thing that I couldn’t pass: The Grilled Fish. It is naturally – becomes a signature dish along the Mekong river. 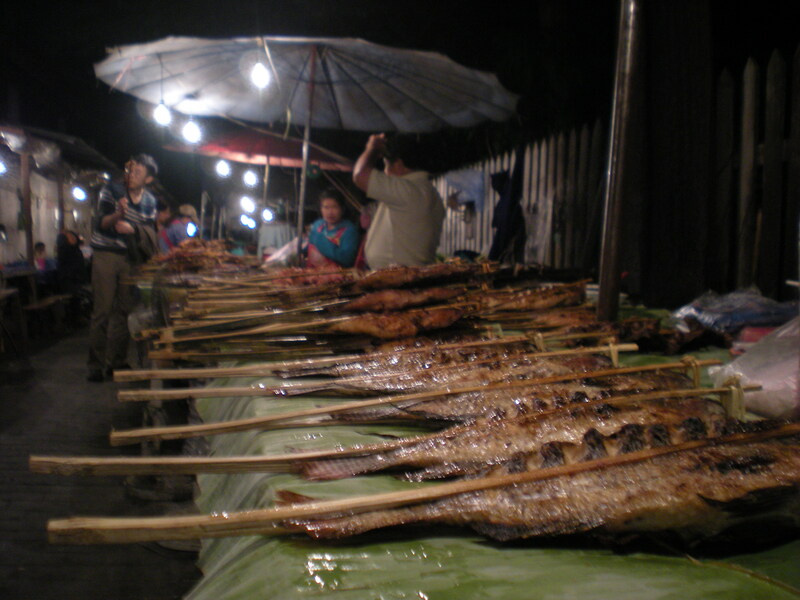 Some people may say yes, you can eat the Mekong grilled fishes the same style anywhere in Cambodia, Thailand too. But no, it tastes so different with the way Laotian make it. And Luang Prabang is the place that I can eat grilled fishes anywhere, from fancy restaurants to small vendors in the markets, it all tastes wonderfully. 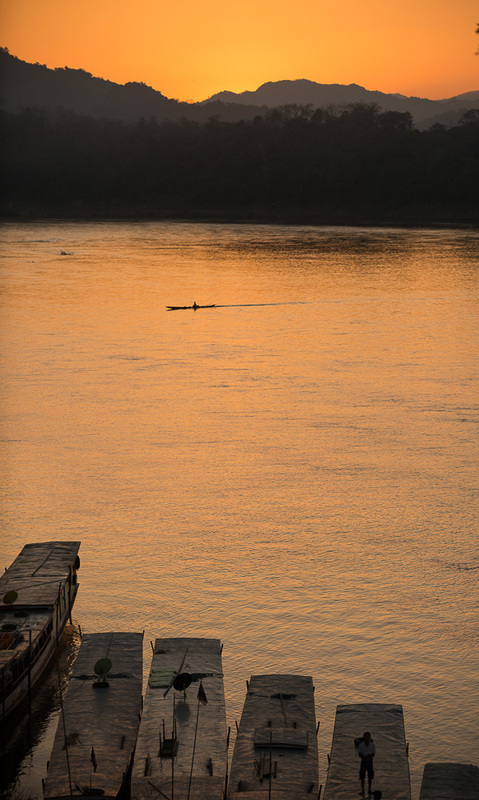 I am no connoisseur, but that is my true love to Luang Prabang, behind the desire of taking the extraodinary photos by the river banks or sunsets, food is the love of my life. I don’t eat to live, never want to, I eat to live and enjoy life – fortunately, until now, I am still be able to do so. If you ask me what I would suggest when visiting Luang Prabang, my ideal trip will be staying on the wood lodge by the riverside, walking distance to the main streets, strolling the night market at night, eating in a cute garden/riverside restaurant or in local market, sipping an icey lemon mint shakes, sitting on one of the balconies bars on main streest for people watching. And I can do all those things for days without getting bored. 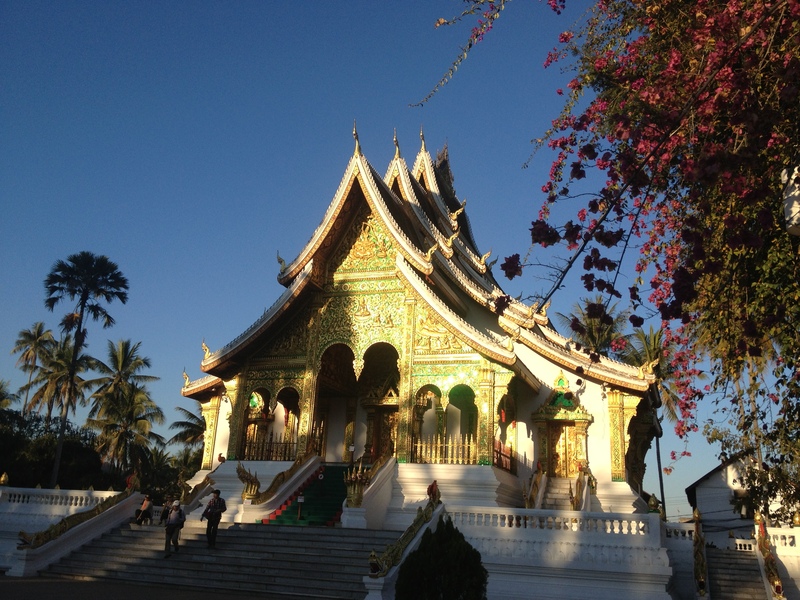 Luang Prabang is the sanctuary for my soul to get calm, a remedy for my never-stop life. It stops there, in Luang Prabang.